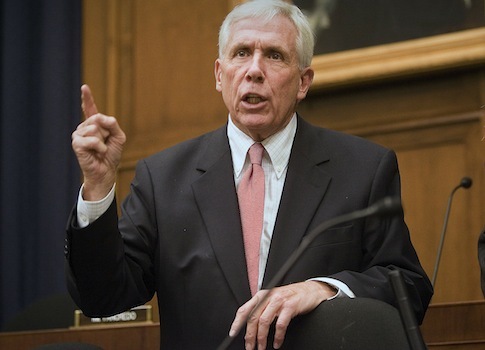 Rep. Frank Wolf (R., Va.) warned that the seizure of key Iraqi cities by a Muslim terrorist group is bringing the region "notably closer" to "establishing a caliphate that spans the northern sections of Syria and Iraq." "The rapid fall of multiple Iraqi cities to the terrorist Islamic State of Iraq and Syria (ISIS) brings the militant group notably closer to its declared aim of establishing a caliphate that spans the northern sections of Syria and Iraq," Wolf said in a statement on ISIS’s invasion and capture of Mosul and other Iraqi cities. "The utter lack of urgency on the part of the administration with regard to ISIS’s efforts to solidify its territorial gains is baffling at best, and inexcusable at worst," Wolf said in a statement. "It is inconceivable that places I, and other members of Congress, visited just a few years ago—and that American men and women gave their lives to help secure—are now falling to hard-lined jihadists," Wolf added. "In essence, this jihadi extremist group, with origins in al Qaeda, is effectively carving out a terrorist state in the heart of the Middle East before our eyes and the Obama administration appears to have no plan to respond," the statement continued. "The president’s precipitous withdraw from Iraq and continued failure to develop a coherent policy to fight extremists in Syria has undermined the ability of the U.S. and our allies to prevent these troubling developments which have seismic consequences for the region and U.S. national interests," Wolf warned. This entry was posted in National Security and tagged Frank Wolf, Iraq. Bookmark the permalink.